technology – we have the right equipment to meet your needs. Reactor 2 systems offer a three-year extended warranty on control modules, display module and electric motor. See product manual for specific warranty details. Like you, we want customers to be completely satisfied with their spray foam and coatings application investment. Graco’s goal is to provide equipment advancements that help you and your crews apply materials more accurately and more efficiently – as the material suppliers intended, to help grow your business. the ADM also has the ability to download data onto a USB drive for further analysis. The power to control your business – wherever you are. 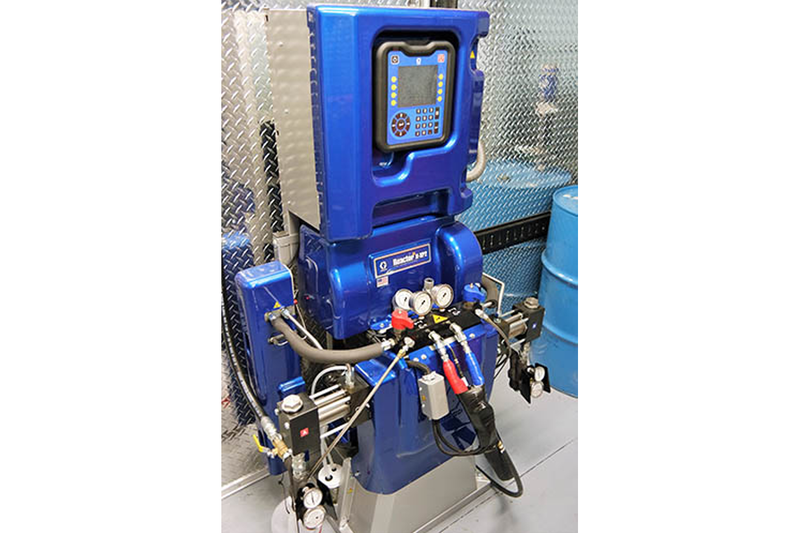 The information Graco InSite gathers can save you money, help you bid jobs more accurately and troubleshoot problems more quickly, saving lost overhead and revenue. The data it collects is stored and available anywhere you can access the Internet. For full Graco InSite details and to navigate a demo, visit gracoinsite.com! Graco InSite is standard on Reactor 2 Elite models. with your smart phone or device. The scan takes you directly to help.graco.com that provides up-to-date advanced trouble shooting information. Graco designed the electronics in the Reactor 2 systems to a stringent electronics reliability standard. These modules are more robust and able to withstand a wider range of power spikes or surges. As an added level of protection, Graco also added a sacrificial surge protector to Reactor 2 systems. If there is an excessive power spike, you only have to replace this smaller, less expensive part – not the entire control module. All Reactor 2 models include a spare sacrificial surge protector to get you back up and running immediately. The advancements in spraying technology will increase your profits. Other Polyurea Coatings equipment manufacturers are light years behind the technology that Graco has introduced to both the Spray Foam and Polyurea Industries. Also, check out the Graco H-XP3 Reactor 2 for higher Volume Polyurea Applications.